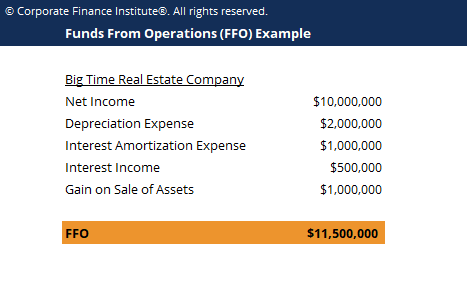 In order to calculate the FFO, one must add the expenses or losses, which are not actually incurred from the operations, such as depreciationDepreciation ExpenseDepreciation expense is used to reduce the value of plant, property, and equipment to match its use, and wear and tear over time. Depreciation expense is used to better match the expense of a long-term asset to the revenue it generates., amortization, and any losses on the sale of assets, to net incomeNet IncomeNet Income is a key line item, not only in the income statement, but in all three core financial statements. While it is arrived at through the income statement, the net profit is also used in both the balance sheet and the cash flow statement.. Then subtract any gains on the sale of assets and interest income. FFOs are commonly used by companies that engage in Real Estate Investment Trusts (REITs)FinanceCFI's Finance Articles are designed as self-study guides to learn important finance concepts online at your own pace. Browse hundreds of finance articles and guides to learn about the cost of capital, financial analysis, ratios, multiples, rates of return, profitability metics, and how to evaluate the overall, a business that primarily operates on income-generating real estate transactions. REIT companies are involved in commercial real estate – selling, leasing, and financing of office and apartment buildings, warehouses, hospitals, shopping centers, hotels, and timberlands.